The dedication of the Ideal Continental Liaison Office for Europe launched a new era of expansion for the Church of Scientology on the continent. Scientologists from 43 nations were joined by Church ministry representing every Church of Scientology in Europe for the ceremony. The historic grand opening of the Continental Liaison Office Europe in Copenhagen, Denmark, was celebrated by more than two thousand Scientologists from 43 nations on Saturday, October 25. Grand opening ceremonies commemorated the new Ideal Continental Liaison Office Europe—the center of ecclesiastical management for Scientology organizations across Europe and home of the religion’s largest translation unit. The 98,000-square-foot facility is the world’s first Ideal Continental Liaison Office, the center of ecclesiastic management for Scientology Churches, Missions and groups across every European nation. 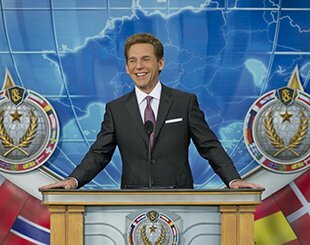 The new Continental Liaison Office for Europe marks the next major step toward the completion of an Ideal European Scientology Base. In the expansive reception area, the Continental Liaison Office welcomes Church and Mission executives, ecclesiastical ministry staff, and representatives of every sector of Scientology for conferences and training. Displays in the Continental Liaison Office Europe reception present the international scope of the Scientology religion. The group of nations across Europe served by the new Ideal Continental Liaison Office are represented at the entrance to the headquarters. The new Continental Liaison Office Europe Translations Unit provides religious materials in 50 languages—up from the current 17. The state-of-the-art Translations Unit in the new Continental Liaison Office Europe is the largest such Scientology facility, accommodating a broad array of languages including Albanian, Bulgarian, Ukrainian, Serbian, Romanian and Arabic. The Translations Unit features a bank of studios for recording translations of L. Ron Hubbard lectures in multiple languages, making Dianetics and Scientology available to more than five billion people worldwide. The CLO EU houses state-of-the-art studios for producing audiovisual materials for distribution throughout Europe. The Staff College provides administrative and ecclesiastical training to Continental Liaison Office staff and Church ministry from across Europe. The CLO EU includes facilities designed to establish and expand every sector of LRH technology. The CLO EU provides for the ecclesiastic management of all Scientology Churches, Missions and groups continent-wide. The Conference Center serves as a venue for staff religious services. It further hosts continental conferences with visiting members of ecclesiastical ministry representing all levels of Scientology activity in Europe. In every Scientology Church in the world stands an Office of L. Ron Hubbard in honor of the religion’s Founder and symbolizing the Church’s ongoing dedication to his writings and ideals. If you happened to be in Copenhagen, Denmark the afternoon of October 25, you could have seen the future of Scientology in Europe unfold literally before your eyes. An historic moment in the Church of Scientology’s ambitious global progression arrived this Saturday with the dedication of its Ideal Continental Liaison Office for Europe (CLO EU). The sprawling facility’s importance as a central European headquarters fueling the religion’s epic expansion throughout the continent and indeed the world cannot be overstated. A rousing celebration greeted the grand opening of the 98,000-square-foot hub housing the ecclesiastical management activities for every sector of Scientology activity all around Europe. That includes the Churches and the Advanced Organization that deliver the Scientology Bridge to Missions, groups and individual Scientologists across the European continent, as well as broad-scale social outreach. On hand to partake of the festivities were thousands of Scientologists from throughout Europe, their presence speaking to the Church’s ever-expanding reach and popularity with nations in every corner of the EU – from England to Poland, France to Italy, Greece to Finland and all of the regions in-between. The new Continental Liaison Office stands on a three-acre campus in Copenhagen’s Glostrup Commune, some 20 minutes from the city center and literally around the corner from the New Era Publications printing and publishing plant. Its role in the Church mix will find it serving as a continental training ground for the Scientology ministry as well as an emanation point for every Church-sponsored social betterment and humanitarian activity across Europe. CLO EU is unique among Scientology continental centers in that it carries the responsibility to translate Dianetics and Scientology Scripture for a region spanning Norway to the Indian subcontinent to Southern Africa. This speaks to the growing demand for Scientology materials that the Copenhagen headquarters addresses, accommodating the religion’s most voluminous translation unit. Mr. Miscavige added that the facility is further designed to raise the number of Golden Age of Knowledge and Golden Age of Tech Phase II materials, with more than 80 percent of all indigenous dialects to be disseminated – from Albanian and Bulgarian to Ukranian, Serbian, Romanian and Arabic. A bank of state-of-the-art audiovisual studios will expand language translation capacity from 17 languages up to 50. The opening serves to carry forward the momentum generated by Scientology’s explosive international growth. It began with the proliferation of Ideal Churches of Scientology throughout every continent, each providing the full scope of religious services to their parishioners and humanitarian programs to communities. That was followed by the age-defining release of Golden Age of Tech Phase II, resulting in unparalleled numbers of Scientologists advancing up the Bridge to Total Freedom. It led a few months later to the Church’s establishment of Ideal Advanced Organizations and all toward the formation of Ideal Sea Org Bases in every continental zone. New Era Publications, the fully digital, on-demand printing facility that produces all Scripture for Scientology Churches, Missions and groups continent-wide. All new accommodations for Scientology ministry located on a six-acre property along the Danish straits. The Ideal Advanced Organization and Saint Hill of Europe (AOSH EU), opened in February of this year and located in the heart of Copenhagen. The new Ideal Organization of Denmark in its landmark building on Copenhagen’s renowned Stroget walking street. And the fully remodeled, seven-story Nordland Hotel, a full-service hotel that will provide more than 80 guest rooms to accommodate Scientologists arriving for services from nations across Europe.